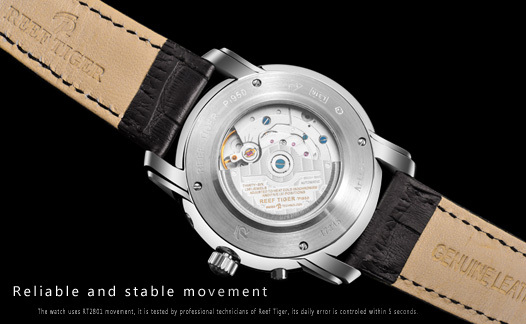 The inspiration of Artist Constant came from the industrial revolution of the 18th, expressing its exploration and relentless pursuit of watchmaking technology, the watch can be called the classic and timeless model of Reef Tiger. 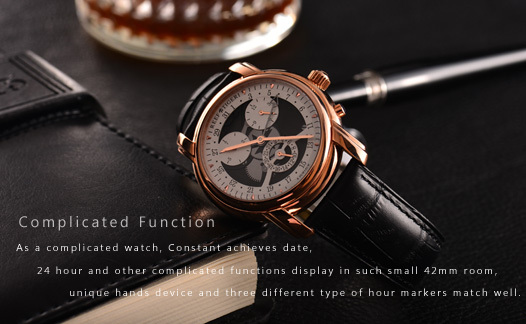 The case adopts the classical aesthetic elements, its bezel and case are separated, lugs extend from the bezel and use three-dimensional structure, the whole watch emits rich classical beauty of art. As a complicated watch, Constant achieves date, 24 hour and other complicated functions display in such small 42mm room, unique hands device and three different type of hour markers match well. The watch is fitted alligator leather strap, which is hand-stitched and reflects pure Swiss watch-making tradition. The clasp features Reef Tiger pink buckle, and is engraved “Reef Tiger” logo, very easy to be worn. 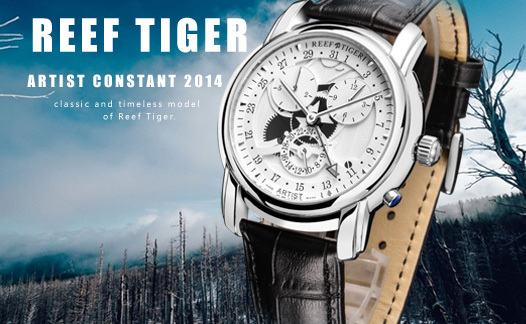 The watch uses RT2801 movement, it is tested by professional technicians of Reef Tiger, its daily error is controled within 5 seconds. Perfectly chamfered bridges, polished edges and gears, each detail passes fine craftsmanship. The inner and outer layers of the band all use imported Italian calfskin leather, which has a comfortable touching. The applied half enclosed technology makes the watch more elegant.